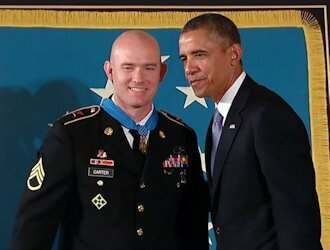 President Barack Obama awards Staff Sergeant Ty M. Carter, U.S. Army, the Medal of Honor for conspicuous gallantry on August 26, 2013. 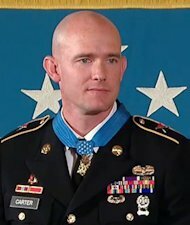 Staff Sergeant Carter received the Medal of Honor for his courageous actions while serving as a cavalry scout with Bravo Troop, 3rd Squadron, 61st Cavalry Regiment, 4th Brigade Combat Team, 4th Infantry Division, during combat operations in Kamdesh District, Nuristan Province, Afghanistan on October 3, 2009. Staff Sergeant Carter is the fifth living recipient to be awarded the Medal of Honor for actions in Iraq or Afghanistan. THE PRESIDENT: Good afternoon, everybody. Please be seated. Welcome to the White House. Actually, I should say welcome back. Many of you joined us earlier this year when we presented the Medal of Honor to Ty Carter for his actions in the very same battle that we remember today. Clint could not be here. He's engaged this week in a cause that is very close to all of our hearts -- and that's ending homelessness among our veterans. But we are honored to welcome back some of the men who fought that day -- at Combat Outpost Keating, members of Black Knight Troop -- and the Gold Star families of those who gave their lives that day. As these soldiers and families will tell you, they're a family, forged in battle and loss and love. So today is something of a reunion. And we come together again, with gratitude and pride, to bestow the Medal of Honor on a second member of this family -- Staff Sergeant Ty Carter. Before they came, Ty said he was hoping to take his children around Washington to show them the sights and the history. But, Jayden, Madison, if you want to know what makes our country truly great, if you want to know what a true American hero looks like, then you don't have too look far. You just have to look at your dad. Because today, he's the sight we've come to see. Your dad inspires us, just like all those big monuments and memorials do. For this is a historic day -- the first time in nearly half a century, since the Vietnam War, that we've been able to present the Medal of Honor to two survivors of the same battle. Indeed, when we paid tribute to Ty Carter earlier this year, we recalled how he and his team provided the cover that allowed three wounded Americans -- pinned down in a Humvee -- to make their escape. The Medal we present today, the soldier that we honor -- Ty Carter -- is the story of what happened in that Humvee. 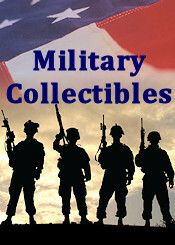 It's the story of what our troops do for each other. As some of you may recall, COP Keating was not just one of the most remote outposts in Afghanistan, it was also one of the most vulnerable -- on low ground, deep in a valley, surrounded by towering mountains. When soldiers like Ty arrived, they couldn't believe it. They said it was like being in a fishbowl -- easy targets for enemies in the hills above. And as dawn broke that October morning, with Ty and most of our troops still in their bunks, their worst fears became a reality. Back in that Humvee, Ty and Brad held out, for hours; rolling down the window, just a crack, taking a shot, over and over; holding the line, preventing that outpost from being completely overrun. Ty would later say, “We weren't going to surrender.” We were going to fight “to the last round.” And then they saw him -- their buddy, Stephan -- on the ground, wounded, about 30 yards away. And then Ty stepped out again -- recovering a radio, finally making contact with the rest of the troop, and they came up with a plan. As Ty Carter and his team provided cover, these three soldiers made their escape -- Ty, Brad carrying Stephan on a stretcher, through the chaos, delivering Stephan to the medics. Now, Ty says, ”This award is not mine alone.” The battle that day, he will say, was “one team in one fight,” and everyone “did what we could do to keep each other alive.” And some of these men are with us again. And I have to repeat this because they're among the most highly decorated units of this entire war: 37 Army Commendation Medals, 27 Purple Hearts, 18 Bronze Stars for their valor, nine Silver Stars for their gallantry. So, soldiers of COP Keating, please stand. Today, we also remember once more the eight extraordinary soldiers who gave their last full measure of devotion -- some of whom spent their final moments trying to rescue Ty and the others in that Humvee. And we stand with their families, who remind us how far the heartbreak ripples: Five wives -- widows -- who honor their husbands. Seven boys and girls who honor their dad. At least 17 parents -- mothers and fathers, stepmoms and stepdads -- who honor their son. Some 18 siblings who honor their brother. Long after this war is over, these families will still need our love and support -- for all the years to come. And I would ask the COP Keating families to stand and be recognized, please. 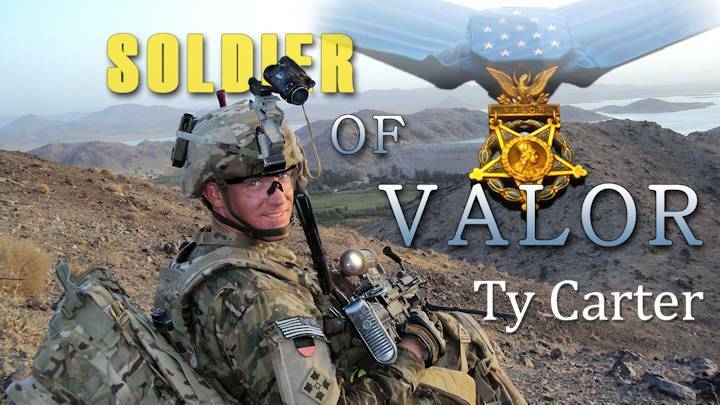 Finally, as we honor Ty's courage on the battlefield, I want to recognize his courage in the other battle he has fought. Ty has spoken openly -- with honesty and extraordinary eloquence -- about his struggle with Post-Traumatic Stress -- the flashbacks, the nightmares, the anxiety, the heartache that makes it sometimes almost impossible to get through a day. And he's urged us to remember another soldier from COP Keating who suffered, too, who eventually lost his own life back home, and who we remember today for his service in Afghanistan that day -- Private Ed Faulkner, Jr.
At first, like a lot of troops, Ty resisted seeking help. But with the support of the Army, the encouragement of his commanders, and most importantly, the love of Shannon and the kids, Ty got help. The pain of that day, I think Ty understands, and we can only imagine, may never fully go away. But Ty stands before us as a loving husband, a devoted father, an exemplary soldier who even redeployed to Afghanistan. So now he wants to help other troops in their own recovery. And it is absolutely critical for us to work with brave young men like Ty to put an end to any stigma that keeps more folks from seeking help. So let me say it as clearly as I can to any of our troops or veterans who are watching and struggling: Look at this man. Look at this soldier. Look at this warrior. He's as tough as they come. And if he can find the courage and the strength, to not only seek help, but also to speak out about it, to take care of himself and to stay strong, then so can you. So can you. And as you summon that strength, our nation needs to keep summoning the commitment and the resources to make sure we're there when you reach out. Because nobody should ever suffer alone. And no one should ever die waiting for the mental health care they need. That's unacceptable. And all of us have to do better than we're doing. As Ty knows, part of the healing is facing the sources of pain. As we prepare for the reading of the citation, I will ask you, Ty, to never forget the difference that you made on that day. Because you helped turn back that attack, soldiers are alive today -- like your battle buddy in that Humvee, Brad Larson, who told us, “I owe Ty my life.” Because you had the urge to serve others at whatever cost, so many Army families could welcome home their own sons. And because of you, Stephan's mother Vanessa, who joins us again today, is able to say “Ty brought Stephan to safety, which, in the end, gave him many more hours on this Earth. Stephan felt at peace.” And she added, in the words that speak for all of us, “I'm grateful to Ty more than words can describe.” That's something. And with that, I'd like the Citation to be read. THE PRESIDENT: Well, thank you very much, everybody. I hope you all enjoy the reception. I want to not only thank Ty, but once again thank his extraordinary family, thank his unit, and thank all of you for us being able to acknowledge the extraordinary sacrifices that our men and women in uniform make every single day. And Ty is representative of exactly the kind of people and the quality of people who are serving us. We are grateful to them. God bless you all. God bless America. Thank you.